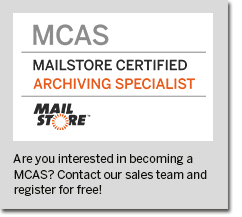 We provide our partners with the option of proving their established technical MailStore expertise for free with certification as a MailStore Certified Archiving Specialist (MCAS). End customers also profit from this offer of certification as it assures them of the partner’s expertise and helps them find a suitable partner. These are very good reasons to become MCAS certified. We present you with the most important aspects of MCAS to ensure potential partners are able to create a more detailed image of the certification process. Any tech-savvy employee working for a registered MailStore Partner can participate in certification. Resellers can talk to their distributors or contact the MailStore sales team via email if there is no support from the distributor. The employee that wishes to become certified must provide their name, surname, and email address. Participants receive the MCAS Study Guide to study in their own time once they have successfully signed up. This guide covers all topics that are relevant for the successful implementation of MailStore Server. Participants can also get information about specific topics from the MailStore Server Manual, the Quick Start Guide, and the Implementation Guides. Where Does the Test Take Place and What Format does it Follow? The test takes place online and consists of 40 multiple choice questions. Participants use the URL and access credentials sent to them following registration to complete the one-hour test. Once the online test has been completed, the participant is automatically provided with the result. Participants who pass the test receive a signed certificate as well as a corresponding MCAS logo for online use. Participants who do not pass the test the first time must wait 24 hours before repeating it. They do not require new access data for the online testing system. The online test can be repeated as many times as necessary. What Does MCAS Certification Mean for the Partner Level?